What is Flurry Analytics and how can I connect my Flurry Account? Flurry provides several services, but its Analytics is one of the most popular for app developers. And it'sFREE. Similar to Google Analytics for web sites, you can see your mobile users' behavior and engagement. What do I need to import data from Flurry Analytics? Where Can I find Flurry API Access Code? Flurry API Access Code is per account/group, which identifies your account/group. Step 1: After you sign in, click "manage" on the top left menu. Step 2: You will see "Flurry API Access Code" in the bottom green-ish box. Copy/paste it into your Settings within our service. Click Save. Where Can I find Flurry API Key? 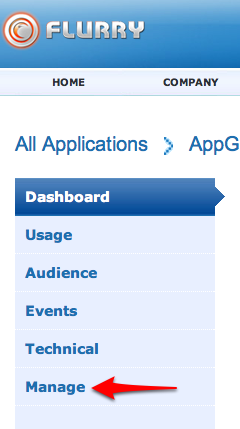 Step 3: Choose an app in your portfolio and go to that app's dashboard. Step 4: Click the "Manage" tab on the left menu. 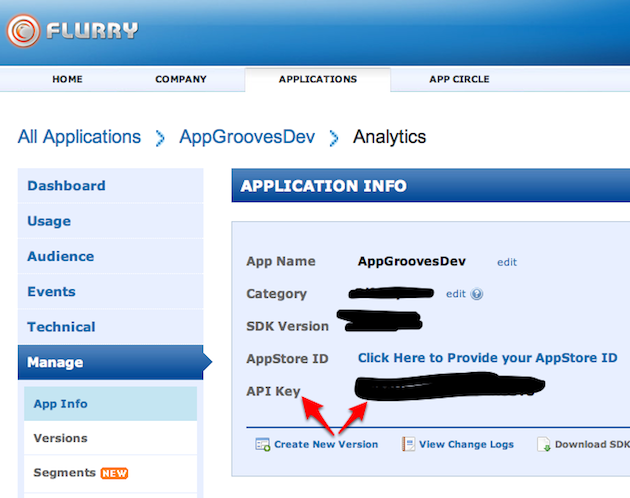 Step 5: You will see "Flurry API Key" in the bottom as shown below. Copy/paste it into your Settings within our service. Click Save. Done! How do I link my iTunes Account? Where is my iTunes Apple ID and Password? Why can't I find my newly launched App on SearchMan? Can I invite members of my team to my SearchMan account?